The word seems to be getting around. Yesterday, a Timmins woman came to the conclusion that the word has not only got around this world but is being whispered around a couple of other worlds, too. It all started Tuesday when Mrs. V. Paolini, 10 Wende avenue, took a look at a Daily Press article and decided something she saw in 1947 must be a space vehicle from another planet. Mrs. Paolini saw a "pure-white" object in the sky to the west of her home sometime in the summer of 1947, about 10 p.m. on a warm night. 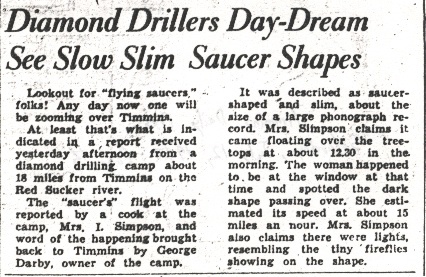 After reading in The Press about a magazine which said the flying saucers and discs variously reported across North America for the past two years were from another planet, Mrs. Paolini bought the magazine. 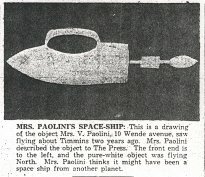 Mrs. Paolini figures that the kind of flying disc she saw was one of the "small, non-pilot carrying disc-shaped aircraft equipped with some form of television or impulse transmitter." This was one of three kinds of space ships which the magazine said were cavorting about infinity. "I'm not sure what it was I saw," says Mrs. Paolini, "but I think it might have been one of these space ships." She saw the pure-white object (see illustration) for about "a split second or two" in the space between two houses. It was heading right for Way and Kent avenues, and seemed to be going rather slowly, says Mrs. Paolini. "It seemed to be heading down at a slant," she says. The space ship - if that's what it was - was "about as big as an aeroplane," according to Mrs. Paolini, who has seen aeroplanes before. The funny thing about this pure-white space ship is that it gave off no light or radiance, according to Mrs. Paolini. The main part was bullet-shaped, with a canopy over it. All this was pure-white, except for a black spot below "observation tower", as Mrs.Paolini remembers it. Trailing along behind were four more sections - three white lines with varying thickness, ending with a lemon-shaped portion. If space vehicles have been making Cook's tours of the Porcupine, no body else has seen them as far as Mrs. Paolini knows. "I never mentioned this to anyone else until recently," she said, and has never heard of anybody else seeing one. She was a bit dubious about the whole thing because her husband was skeptical. "He said it was a meteorite." But after reading the Press and magazine articles, she felt she had to tell about the mysterious disc. Her husband is still skeptical. Mr. and Mrs. Paolini were having tea in the back yard of their home between 10 p.m. and 10:30, some time in the summer of '47. Mrs. Paolini doesn't remember what month it was. She and her husband saw the object flash by, and that was all. It has been disturbing her ever since. "It's something you wouldn't forget for . . . 10 years anyway," she says. Possibly the creatures from Mars - or maybe Venus or Pluto - won't forget their visit to the Porcupine for some time. 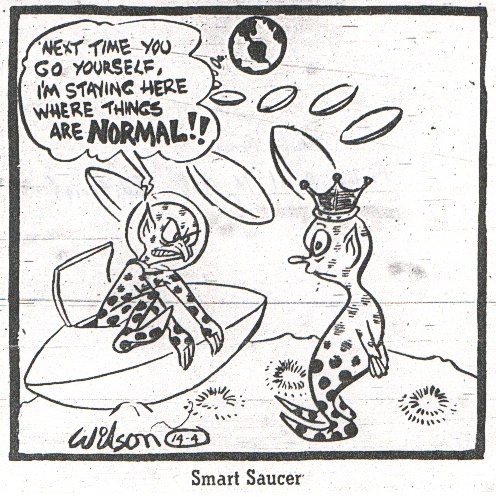 The magazine says these interplanetary thingmedoodles are the fruitition of thinkers 2¼ centuries ahead of our own. Mrs. Paolini's flying what's-it seems to be a standard model, because other people claimed to have seen pure white, bullet-shaped and otherwise-designed objects in the sky during the last year or two. Undoubtedly the 1947 model space-splitter Mrs. Paolini saw has been outmoded by later models, something like the new autos each year - but remember, these chappies don't use cars any more, they're 225 years ahead of us. The Porcupine must have only been discovered recently by flying discs, because the Porcupine has been here for about 40 years and the magazine says they have been with us for 175 years. The magazine says the space ships "come from no enemy on earth," which leaves Russia out of all this. Mrs. Paolini hasn't seen any other flying objects (except birds and aeroplanes), but she probably figures "once is enough." Stand back, everybody, here comes 21751. FORT WILLIAM - Airport employees said yesterday they watched five "unusual" objects streaking through the sky like "brilliant white balls of fire" at about 1:45 p.m. They thought the first object was a bird. "But a bird couldn't possibly fly that fast," said flying-club manager Norman Evans. "There were no wings visible, and they were white - a brilliant white. A bird will seem dark against the sky." Engineer Frank Kearney said he saw one object "like a brilliant white star in the daytime." He said it streaked over the airport high in the sky. He said it travelled over to Lake Superior, then was joined from nowhere by four more. Then all five came back and circled, after which they set off for the northeast. Trans-Canada Air Lines officials witnessed the phenomenon. Said one: "I never saw anything like it before. I won't say it was a flying saucer, but it sure was unusual. Its speed must have been terrific." Several residents in different sections of the city last night reported seeing a luminous object with a long, flame-like tail. The witnesses said it was visible for a matter of seconds, and that it was trailing a bluish streak. One said the streak looked like smoke or vapor. Residents in the Porcupine are discussing the possibility today of the area having been visited by a "flying saucer" last night. Reports flooded into The Daily Press office that nearly 50 people spotted an oval-shaped bright greenish flame flash south-easterly over Timmins, Schumacher and South Porcupine about 20 minutes to midnight. 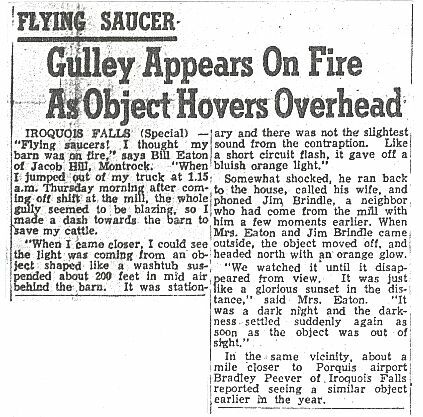 Eye witness accounts vary on the size, height and speed of the object, but all agree that it was something "out of this world." It wasn't a shooting star, jet airplane, or anything they had ever seen before. "It was going about 100 to 150 miles per hour at a height of about 1,500 to 2,000 feet. It was egg-shaped and greenish in color and about four or five inches long. A red flame shot out the back about three feet long." It disappeared after a few seconds. Approximately 30 miners at Paymaster also waiting for the bus, were reported to have seen the object at the same time. The Canadian Press reported today that two steelworkers in Sault Ste. Marie saw a "red ball of fire, like the sun" flash through the sky for a period of 20 seconds just before midnight. Authorities at the Michigan weather bureau were inclined to think the object was a meteor, although they appear rarely at this time of year. The phenomenon was also reported on the Michigan side of the Sault by James Gregg. He said, "It was no flying saucer." It trailed a tail of flame and disappeared in a southerly direction, he added. Mr. Woodley squashed the possibility of the object being a jet plane, because the Porcupine was "too far off the beaten track and it was going so much faster than a jet plane." It was estimated that if there is any connection between the two lights, the object was travelling at a speed of from 800 to 1,200 miles per hour. "There was about 20 feet of clear light, like a green flame, and behind that again, about 25 or 50 feet of sparks. It was going south-east." "From the distance I saw it, about five or six miles, it looked to be going about 1,000 to 1,500 miles an hour. It was visible about one minute. I never saw anything like it in my life before." Mr. Woodley said he didn't think it was a jet plane, because "jets don't fly that fast, or throw sparks like it was. Besides," he added, "a plane wouldn't fly into a storm and a storm was south of us that had just passed over the area." He admitted that it could have veered to the west later to go over the Soo. "We were both looking out the window about ten minutes to midnight when we saw a bright green light, like a round ball going south. It wasn't going very fast." She added that it "wasn't very big and I don't think it was a shooting star." Another young 16-year-old boy, who declined to give his name, telephoned The Daily Press last night and reported seeing two greenish lights going south-east and "not very far apart." He said the light in the last "part" went out first and then the other light went out. He said the time was about 11:40. Gerald McDonald, employee in the time office at the Hollinger Consolidated Gold Mines office last night saw the "light" while waiting for the bus at quitting time. He saw "a light, the size of a dime and very high, about 5,000 feet, going in a horizontal direction from Timmins to Schumacher, when it turned in a southerly direction." He added the direction in which it was going ruled out the possibility of it being a shooting star. He called two other employees, James Sutherland and James McNeil, who corroborated his evidence. He described it as "perfectly round and a brilliant white light. It was visible for three or four seconds," he said. 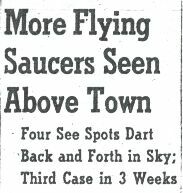 Mary Gagnon, 94 Seventh avenue, saw something about ten minutes to twelve, that "looked like a flying saucer, or like a shooting star" lit up in all colors and with sparks shooting out the back going "pretty fast" southward. It was in the sky about a minute and a half, she said, and gave her time to call her friends Theresa Farrell, Joan and Velma Omichelli and Mrs. "Red" Daley, 73 Commercial avenue. Miss Gagnon had been waiting in an upstair's verandah for a taxi that she had called. The O.N.R. agent at Schumacher, Fred LeGallais, was taking a walk on the platform before turning in for the night, he told a staff reporter last night, when he saw a "pear-shaped orange light" with a tail about 15 or 20 feet long and about five or six feet wide. It was going at about airplane speed, he said, south from Schumacher, but seemed to be "miles away" and was visible for about 30 seconds. "It made no noise," he said, "and disappeared in the direction of Dome mine, going in a straight line." He admitted that he thought it was a jet plane at first, but it was a different shape to the exhaust of a jet. He first spotted it over Hollinger mine, he added, and was going in a south-east direction. SAULT STE. MARIE - Two steelworkers told today of watching "a red ball of fire, like the sun" flash through the sky for a period of 20 seconds just before midnight. The phenomenon was first reported by Timothy Finn who said he saw it while working his night shift at Algoma Steel Corporation. It travelled almost directly north and south, looked to be flying about the height of regular airline flights, and "looked very much like the sun," he said. It seemed to be "throwing off sparks." His report was corroborated by Michael Aho, who was working nearby. "It didn't make any more noise than a slight whooshing sound," he said. SUDBURY - Arthur Penny says he saw a flying saucer heading west over Sudbury about 3 p.m. Saturday. "It looked like two pie-plates, one on top of the other," he told a reporter. "It was smooth and about the size of a small washtub." 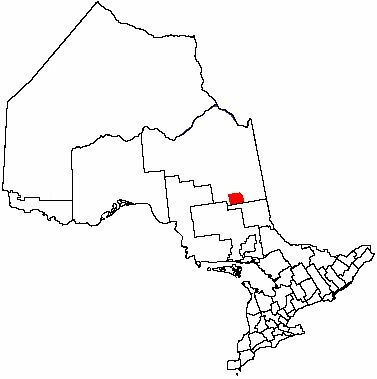 NORTH BAY (CP) R.C.A.F. officials plan to investigate two reports of flying saucers in this area. The reports came from airmen stationed here. WO. E. H. Rossell, a veteran airmen with 13 years in the service, and Flt. Sgt. Reg McRae, a visitor from Weston, said they spotted a "bright amber disk" in the sky over the airfield around 8:30 p.m. Saturday. The two said the disk came from the southwest, moved across the airfield, stopped and then took off in the reverse direction. It climbed at an angle of 30 degrees at "terrific speed" and disappeared. WO. W. J. Yeo, a master telecommunications superintendent, and Sgt. 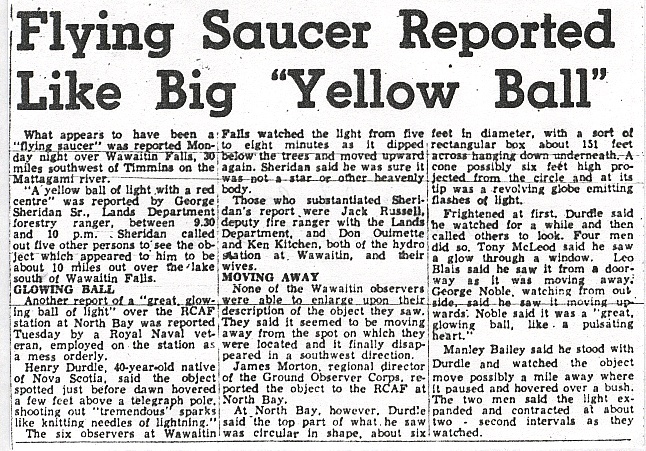 D. V. Crandell, an instrument technician, reported seeing a flying saucer the night of Jan. 1. "The saucer appeared to be at great height, probably outside the earth's hemisphere," they testified. "It appeared to be moving at supersonic speed." The disk was described as reddish-orange in color, "similar to a rock burning." An R.C.A.F. spokesman said yesterday there is no reason to doubt the validity of the reports since the men concerned are seasoned veterans familiar with convention aircraft. COBALT (CP) - The New Year has brought reports of flying saucers in this northern Ontario mining area. Bright white discs were sighted Friday and Saturday by at least 10 persons. Others have banded together and are planning to take shots at the objects if they prove hostile. But so far, they have been harmless. A single saucer was observed Friday over Lake Temiskaming by John Hunt, president of the Cobalt Chamber of Commerce, Ray Johnson, mechanic at Agaunico Mines, and Al Jennings, a truck driver. They said it zipped about the sky for almost two hours. On the day after Christmas, Mr. Hunt and Willy St. Jean reported seeing a bright object over the same spot. In North Cobalt Saturday, bright objects were seen by seven other persons. Mr. Maurice Parent, 28-year-old miner, said the light was so bright "it was difficult to look at." An unidentified object sighted to the northwest of Timmins early today has been tentatively identified as a weather balloon. No one, however, can say who launched it, or where. Officials at Timmins Airport said it was a weather balloon. So did Garth Brillinger, director of the Cochrane District Emergency Measures Organization. An anonymous citizen telephoned, speaking authoritatively saying it could possibly be a space observation balloon. He said he had looked at the object and thought there might be a platform on it which would allow transportation of one or two men. If it were an observation balloon, the man said, it would have been launched in Minnesota. Residents of Timmins spotted the object shortly after daybreak today. It seemed to hang suspended in the same place, about four to five miles high, for hours. Persons on their way to work stopped to look at the object. Timmins firemen obtained a telescope from Milne-McDowell Ltd., and used it for a close-up view. They saw what appeared to be a platform, shaped like a tripod, with something at the top. No agreement could be reached as to whether the object at the top of the platform was circular or flat. RCAF officials at Ramore said they were not aware of any weather balloons in the area but said a high pressure area moving from the west could have brought the object with it. An unidentified flying object was reported sighted by four Timmins men Sunday morning while on an ice-fishing trip to Scorch Lake, nine miles east of Foleyet, which is about 60 miles west of here. Metallurgical technician Ken MacNair, 26, of 295 Hemlock St.; clothing salesman Con Pelletier, 28, of 244 Champlain St.; real estate salesman Terry McCormick, 27, of 753 Suzanne St., and assistant health spa manager and part-time trapper Leonard Simon, 22, of Craft Creek Road first reported the incident to The Daily Press. The men had just parked their car on the side of Highway 101 and were preparing to go to the nearby lake. It was about 7 a.m. and it was still dark. In a taped interview, Mr. McNair, the first man to see the object, describes what he saw. "We got out of the car and I opened up the trunk and we took all our gear out. I just happened to look up and I see this object . . . it was slowly moving toward us." Then, according to Mr. McCormick, "we watched it and none of us said a word for about 40 seconds." "And the glow was five times brighter than a star at least," Mr. McNair continued. The men added that the object was moving across the south sky from west to east. Mr. Pelletier said the shape of the object was almost rectangular, except that it was wider at the bottom, and the corners were rounded. The glow from the bottom portion of the object was brighter too, he added. "We ruled out all possibility of it being a shooting star, comet or airplane in about 10 seconds. I mean, it was so obvious," stated Mr. McCormick. No noise could be heard from the object. All men took off their hats despite freezing temperatures in an effort to hear better any sound. Mr. Simon said the men at first thought it might be some sort of an airplane but, "when it accelerated like crazy, we thought, no airplane can do that." He estimated that the object was about a mile high and about a mile away. It gave off a "very bright white glow," said Mr. Simon. The men differed in their opinions as to how long they watched the object. The time ranged from 40 seconds to about a minute and a half. "As it progressed, it increased its speed," Mr. MacNair said, "and all of a sudden . . . bang, it was gone!" "The acceleration was incredible," according to Mr. Simon. "We were all convinced then that it was something out of the ordinary," said Mr. McCormick. The men said as far as they knew, they were the only ones to see the UFO. Mr. Pelletier tried to wave down a passing snowplow at the time, but it didn't stop. So, with talk of what they had seen, all went fishing until noon. They caught nothing and saw nothing of the object again. Mr. McCormick said he felt he should report it but didn't know who to go to. He said if he was alone, he wouldn't have said anything to anyone. Ontario Provincial Police in the Foleyet area and at District 15 headquarters in South Porcupine say they have had no reports of the UFO from anyone. 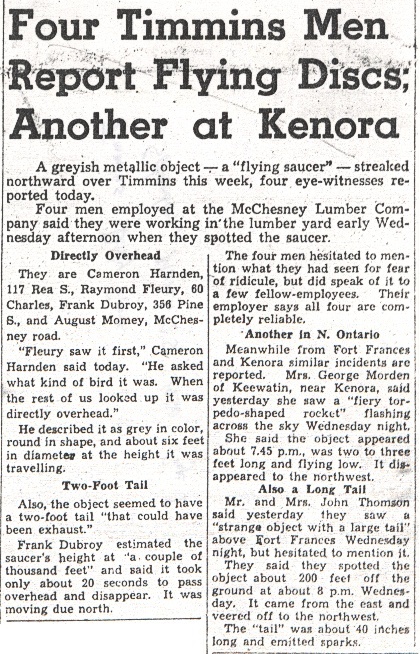 IROQUOIS FALLS (Staff) - An elderly Porquis woman says she sighted an unidentified flying object, Thursday night, but didn't report it to the news media until the weekend because she was afraid others would think she was crazy. 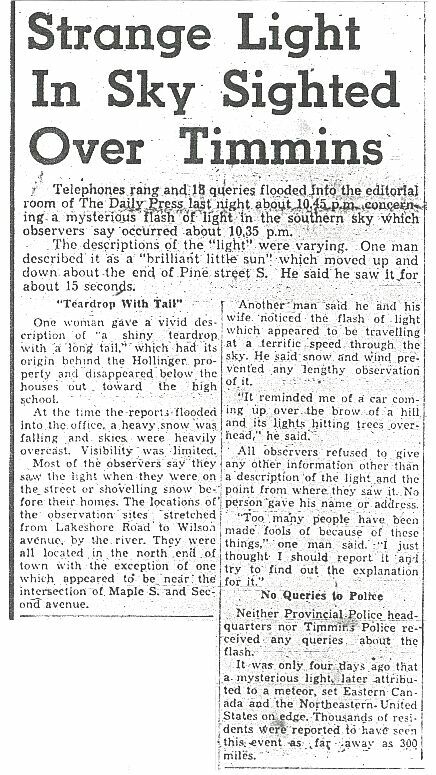 Prompted by radio reports of UFO sightings in southern Ontario during the weekend, Mrs. William Vickers informed The Daily Press. "I'm telling you I really got a start when I saw it...it's something I'll never forget," said Mrs. Vickers. She was sitting at home Thursday night watching television when she saw "a bright ball of light" pass by the living room picture window and the window portals in the front door. The UFO was in the east sky travelling from south to north. Mrs. Vickers marked down the time as 10:20 p.m.
"I jumped up and called for my daughter Ann (Mrs. Andre Carriere of Cochrane). She didn't see it but she heard a terribly loud noise," said Mrs. Vickers. "Then it vanished as quickly as it appeared. It impressed me so much I sat down and made a sketch," said the retired public school teacher. Also, Mrs. Vickers telephoned local Ontario Provincial Police to report the incident and asked them not to report it to the news media. They respected her wishes. When Mrs. Vickers saw the object, it appeared to be about the size of a soccer ball but she couldn't judge its distance. The glowing object was mainly blue and light green with a red streak near the bottom and a hazy pink glow around it. She said the colors themselves were "quite beautiful." She compared the light radiated as similar to sheet lightning. She added that it was something she had never seen before and dismissed the possibility of it being northern lights as she is "quite familiar with that." "I thought people would say I was crazy if I said something so I told the police and left it at that. Then I heard on the radio Saturday morning that somebody had seen one over Lake Ontario so I decided to tell the media," said Mrs. Vickers. 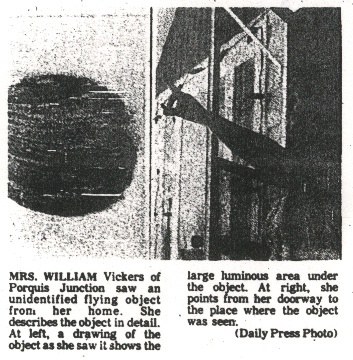 Mrs. William Vickers of Porquis, 45 miles east of Timmins, wasn't the only person who saw an unidentified flying object last Thursday evening. She was, however, the only person in the area to report the sighting to news media and then it was on Saturday, only after she heard broadcast reports of sightings in southern Ontario. Yesterday, following an on-air interview with Mrs. Vickers, CKGB program director Alan Thom found he was swamped with calls from persons who had also seen a bright ball of light in the sky. The first was taxi driver Roger Hayes, 33, of 99 Elm St. S., who saw "a bright flash" in the sky over the north end of the city that night. It was shortly after 10 p.m., about the same time Mrs. Vickers reported her sighting to provincial police in Iroquois Falls. Mr. Hayes went to the Timmins Police Building that night to report what he had seen. Timmins police recorded the time as 10:23 p.m.
"They thought it was a joke," said Mr. Hayes today, "but I thought I'd better report it." Mr. Hayes said he saw a ball that appeared to be about 50 to 75 feet in diameter and it was heading westerly. It was blue, green and yellow in color. Thinking it was an explosion at CFCL Television, Mr. Hayes telephoned the station to ask if anything strange had happened. Station personnel reported nothing. The next call was from Mrs. Rita Roy of Timmins who said she saw a similar object "for two to three minutes" while she was travelling in a car with her husband and family. Because of time, Mr. Thom was unable to interview other listeners who called in. He says, though, that he expects to talk with more persons today. While The Daily Press was making police phone checks this morning, it was learned that receptionist Mrs. Patricia (Ivan) Katic at the OPP office in South Porcupine also saw a UFO Thursday night. A leader of a local wolf cub pack, Mrs. Katic was attending a meeting at Coronation Public School with Mrs. Joe Gubbels and Marie Hol when the sighting occurred. The women were leaving the building around 10 p.m. when they saw what appeared to be a shooting star giving off "a greenish white light." The object then fell to earth said Mrs. Katic and the trio never thought anything about it until other sightings were reported. The latest development occurred around 1:25 this morning when 19-year-old Ray Vaillancourt and his mother Mrs. Georgette Vailllancourt were walking down Second Avenue near Cedar Street. "My God, was it ever big," said Mrs. Vaillancourt as she described the object. It was a mass of light heading north in the western sky on a level path, she added. The object was colored blue, green and red said Mrs. Vaillancourt and was visible for about five seconds. News clippings courtesy of The Timmins Daily Press.